NYSCASA | What Does Self-Care Look Like in 2019? 12 Nov What Does Self-Care Look Like in 2019? 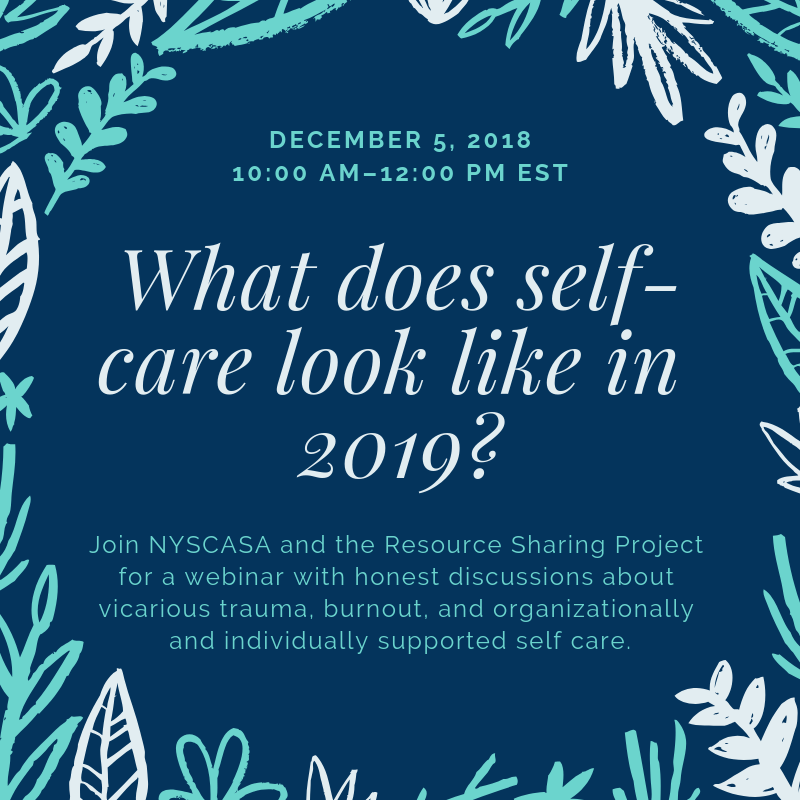 Webinar: Join NYSCASA and Leah Green from the Resource Sharing Project for an honest discussion about vicarious trauma and burnout and learn about organizationally and individually supported self-care. In our country and in our communities, sexual violence has been an unwavering and complex topic in 2018. Between #MeToo, and Times Up, it feels like everyone around us is talking about and paying attention to sexual violence for the first time. Our work feels more legitimate and necessary than ever before. And our work feels more exhausting and constant than ever before. Folks are bringing up sexual violence in line at the grocery store, on social media, and at the dinner table. How do we avoid burnout when the conversation is around us all the time? If this is what 2018 feels like, how are we supposed to navigate self-care as we prepare to step into 2019? Join Leah Green from the Resource Sharing Project for a webinar where we will have honest discussions about vicarious trauma and burnout and learn about organizationally and individually supported self-care.